For cabinet doors, clock cases, etc. 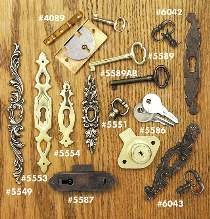 Order your choice of any decorative key plate, #5587 Lock, and either #5589 or #5589AB Key. Lock mounts flush on back of door. For a false or "mock" key pull, order #5551 which includes a dcorative plate and a pull knob that looks like a key. #5586 Drawer Lock attaches to back of drawer. #5586 Lock includes two keys. All drawer locks are keyed alike. Key plates and locks include mounting hardware. OK to mix or match for quantity discounts.